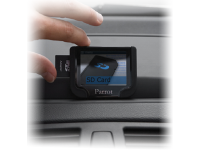 Additional products avaiable for fitting to your new vehicle prior to delivery. Colour coded to vehicle. Adjustable (for vehicles with towbars or rear mounted spare wheel). 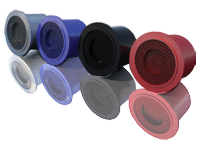 MTS Parking sensor systems use ultrasonic proximity detectors, these are flush fitting sensors embedded in the rear bumper to measure the distances to nearby objects at low level. The sensors measure the time taken for each sound pulse to be reflected back to the receiver. Depending on the speed of the vehicle and the distance to the obstacle, the system will warn the driver by visual and/or audible means about the risk of collision. The feedback to the driver will generally indicate the direction and proximity of the obstacle. Sensors are fitted to the rear of a vehicle but may also be fitted to the front. Rear sensors are activated when reverse gear is selected and then deactivated as soon as any other gear or neutral park is selected. Front sensors are activated by either a simple on/off switch mounted on the dashboard or newer vehicles can be fitted with a hi-tech speed pulse relay, which can be fitted to the vehicles digital speed pulse signal, if permitted. 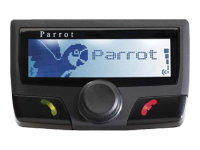 Parrot CK3100 with LCD Screen. Includes music streaming & steering wheel control.